Browse: Home / Sneak Peek into Issue #30 of The Abolitionist! Sneak Peek into Issue #30 of The Abolitionist! We’re excited to announce that Issue 30 of The Abolitionist Newspaper is on its way to publication in the next two weeks! 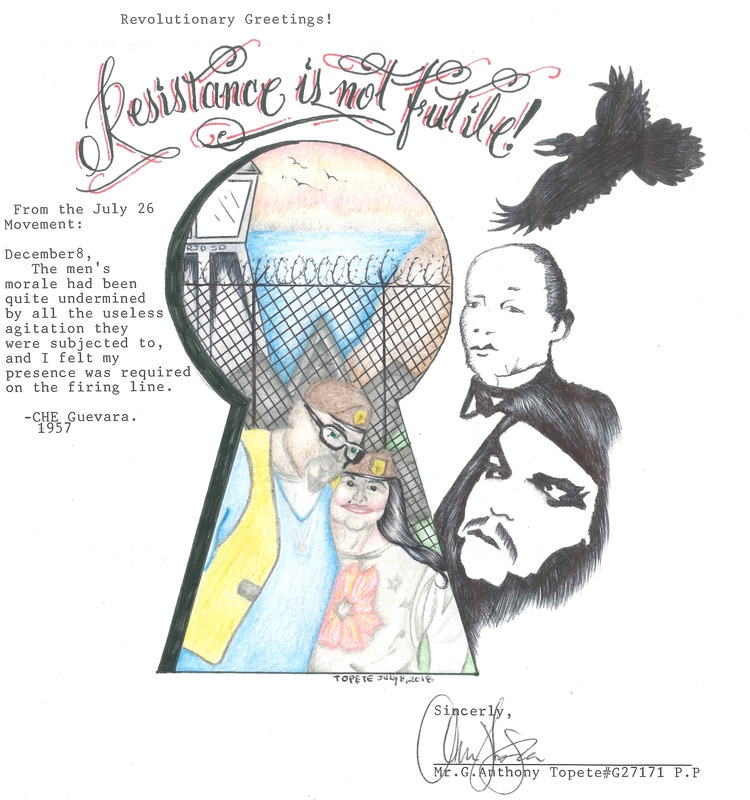 This issue is themed “Tearing Down the Walls from Both Sides,” and delves into the necessity, strengths, challenges, opportunities, and strategies of organizing with people across prison walls. As a sneak peek to what you can expect from this issue, we are posting a beautiful, concise, and politically sharp piece titled, “How People on the Outside Can Support the Political Work of People on the Inside,” written by imprisoned organizer Stephen Wilson – check it out and share. And subscribe today to get a fresh copy mailed to as soon as this issue goes to print! 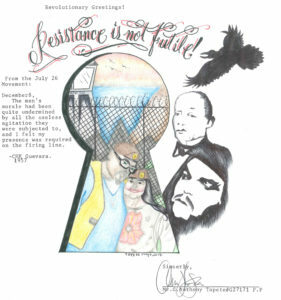 “Resistance is not futile,” an art piece by Mr. G. Anthony Topete appearing in Issue 30 of The Abolitionist. He is currently imprisoned in RJ Donovan Correctional Facility in San Diego, CA. Don’t speak for us. We can speak. When we cannot, due to repression or threats from prison officials, use your freedom and privilege to amplify our voices and advance our issues. Be accomplices. Put yourselves out there for us. Attend rallies and speak out against the PIC. Organize call-ins to prisons. Show up at courthouses. Disrupt. Disrupt. Disrupt the PIC. Whenever you organize, strategize or confer, make your spaces inclusive and accessible. Take note of who’s missing. Find them, invite them and include them. If they don’t come to you, go to them. Often, those who are missing are our families and our friends. Remember, we don’t have Internet access. The latest news is not just a click away for us. Create offline publications (newsletters, magazines, journals, letters) to keep us informed and educated. Provide platforms for our voices. Employ an intersectional analysis. Identity does not equal experience. We are all prisoners, but we experience imprisonment differently. The experiences of an able-bodied, straight, cisgender male is very different from those of a trans/queer, disabled woman of color. Many of us struggle under multiple oppressive structures, but prevalent ideas of prison center upon able-bodied, straight, cisgender males. Broaden your understanding of who is affected by the PIC and how. Financially support activists behind the walls. Everything costs money in prison. Many know how the PIC extorts us and our families. In Pennsylvania, prisoners make about $0.19 an hour (4 to 6-hour shifts, 5 days a week). A bar of soap costs $0.85. For many prisoners, a day’s wages won’t buy a bar of soap. So how can we afford books, journals, writing supplies or postage? Sending a letter costs 3 hours’ wages! A little support goes a long way. If inside activists’ views and ideas are to be included, if our experiences are to be centered, you have to support our efforts at studying, organizing and communicating with you. Learn what really happens in here. Don’t assume. Oftentimes, reforms are pushed, and their ultimate results adversely affect prisoners. The PIC is adept at morphing demands for reform into measures that further oppress prisoners. Before and after campaigns and initiatives, solicit the views and experiences of prisoners. Join us in advancing issues that truly create safe communities. For example: increased school funding, community mental health clinics, universal health insurance, living wages, community substance and alcohol treatment programs, transformative justice programs, decarceration and decriminalization efforts. This way, when we are released we’ll have less chance of returning to prison. Take care of yourselves. We need you. This fight is for the long term. We need you struggling alongside us and our families for the duration. Create and find joy in the struggle. Find time and space to rejuvenate and recalibrate. Be good to yourselves. Breathe. Stephen Wilson is a currently imprisoned, Black, queer writer, activist and student. For over two decades, he was active in the Ballroom community and work as an HIV-prevention specialist and community organizer. His work and practice inherit teachings from prison abolition, transformative and racial justice, Black feminist theory, and gender and queer liberation. Specifically, he works to end cycles of poverty and incarceration that have plagued his community. He works to expose and dismantle the prison-industrial complex and to build a world in which we deal with harm without caging or exiling other people.